As most of us have made the leap from the tiny world of the 17" display to the more wide-open pastures of the now common 19", there still remains one more step towards the pinnacle of cathode-ray monitors. That last step may very well be the SyncMaster 1100P-plus. Weighing in at nearly 60lbs, the 1100P-Plus will make any 17", or even 19" for that matter, look like a "Mini-Me." 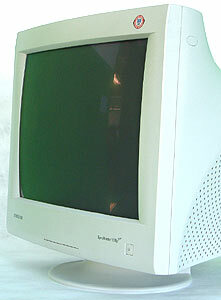 Of course we're talking about a 21" CRT monitor here, and one with [RGB, HV, V] BNC inputs to boot. 21" full square picture tube. Horizontal dot pitch of 0.21mm. Flat face 90 degree deflection, anti-reflective coating with anti-electrostatic properties, medium short-distance phosphor. 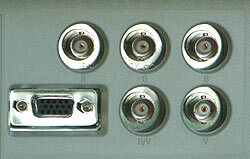 15-pin D-sub analog video input and BNC connectors. Comes with: 6 foot power cord, 6 foot video cable, drivers, manual. While most home users are familiar with the analog 15-pin video input on the back of our monitor or video card, the BNC connections is less widely known. The reason being is that BNC connectors are generally used in more high-end applications than simply gaming or day to day work. Now of course, the 1100P-Plus can be used in an every day environment, but should your business require working with something a little more high end it is worth while to note that these features are available. Since we do not have any video adapters which require a BNC connection to the display we are unable to test this component. BNC connectors are used in applications generally beyond the scope of this review.